No one wants to be a wall hugger – that person who is constantly looking for an outlet to charge their phone. 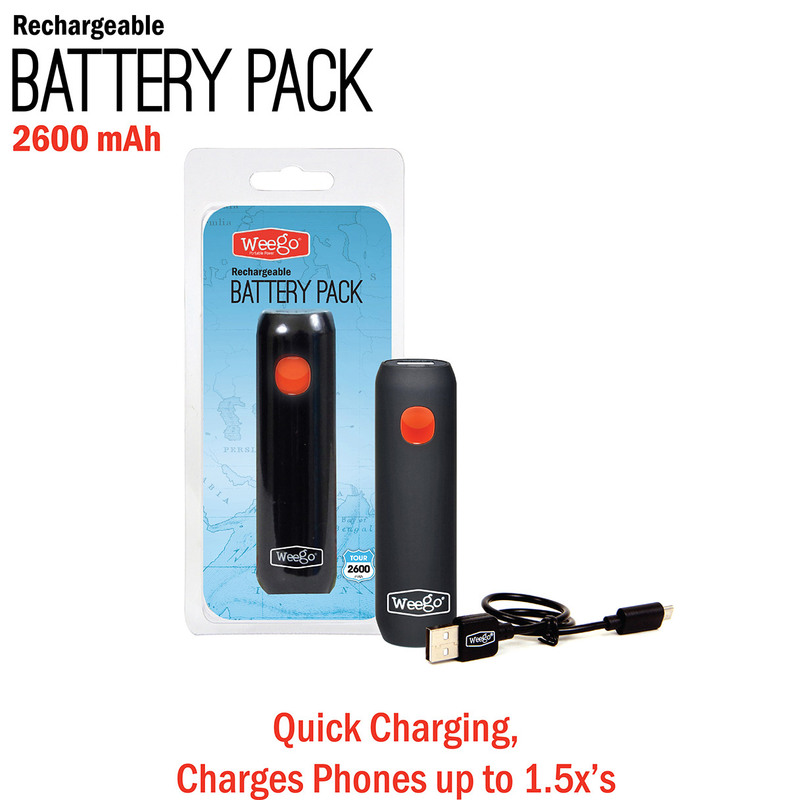 Break free from the wall with out portable, rechargeable battery packs. 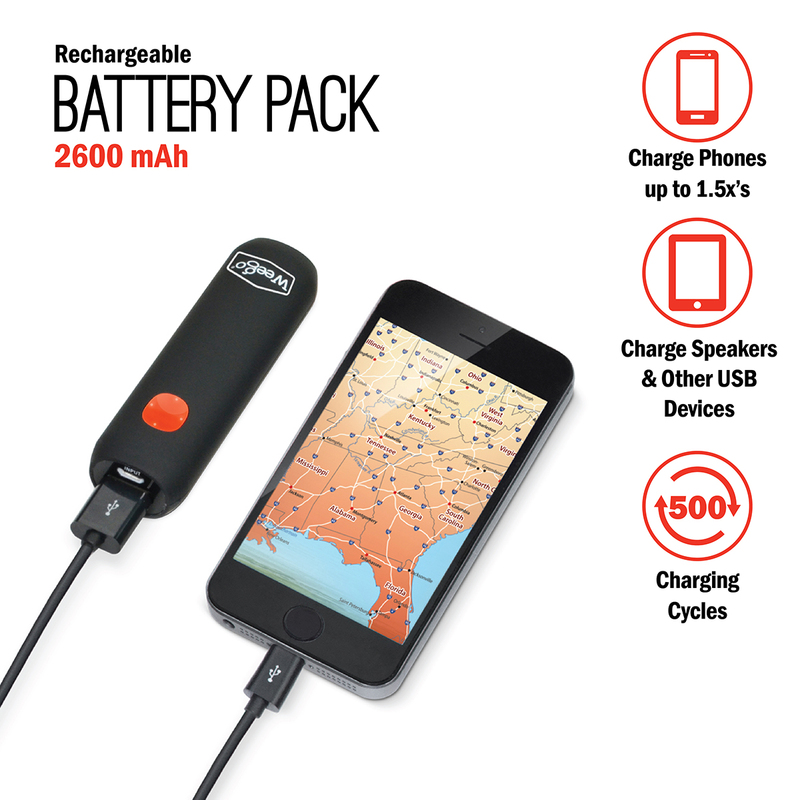 The Tour 2600 is perfect for keeping your smartphone, speakers, watches and other USB devices charged. It’s packed with enough power to give up to 1.5 extra charges to most smartphones. Don’t bother with the cheap, no-name battery packs that work for a month and then suddenly die off. 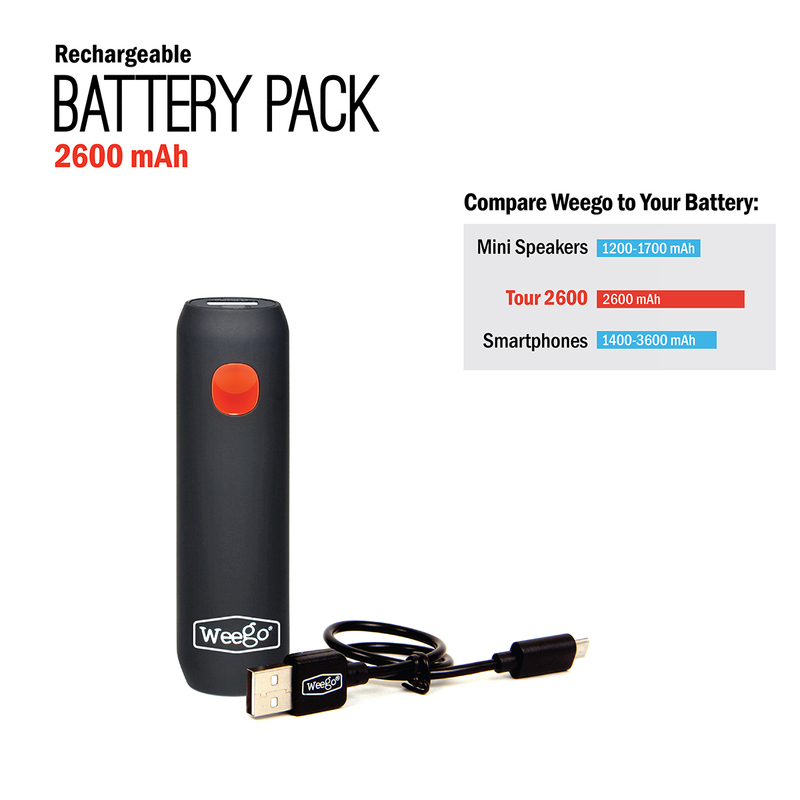 The high quality lithium-ion cells used in Weego Rechargeable Battery packs ensure you have a charge that’s going to last. Backed by an crazy long 18-month warranty, you have no need to worry about an all-too-short lifespan.The quality lithium-ion battery cells provide 500 full charge and discharge cycles which means your Weego can last for years. If you’re in the market for a Weego, then safety and performance matter to you. Beware of other products that make unverifiable claims or offer products at steep discounts. Our pocket sized rechargeable battery pack is made with durable, high quality components and built-in circuitry protections to ensure your safety. We use independent labs to verify the quality and performance of our battery packs so you can count on them to work. All Weego products are backed by a crazy long 18-month warranty and dedicated online support for your assurance. 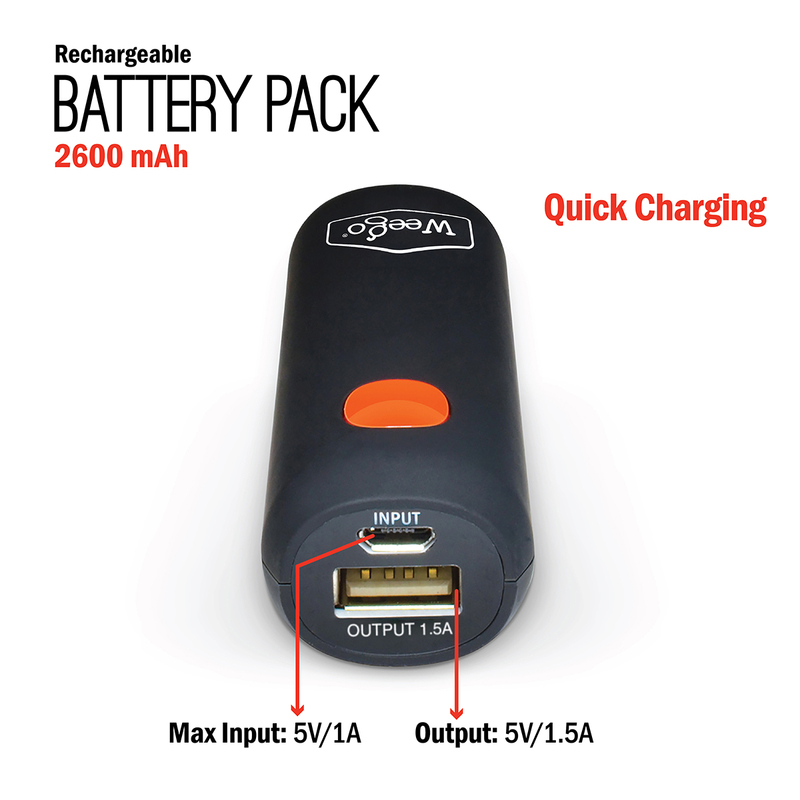 Each Tour 2600 Rechargeable Battery Pack is pre-charged and comes with a 12? long micro USB charging cord (Apple users will need to use your own USB cord). To power up, simply connect Weego to your device and press the ‘on’ button. When your Weego needs recharging, power it back up with your wall adapter, car charger or laptop’s USB port. It’s that simple! One of the safest and smartest investments that any automobile owner can make is to purchase quality auto parts, such as the Weego Battery Charger. What many people don't realize is that purchasing low quality, inferior parts can be more costly than they realize. A low quality part may fail quickly and require more frequent replacement that a quality part such as the Weego Battery Charger. For this very reason, we only stock the top quality parts and top quality brands. Weego, a manufacturer known to manufacture a high quality Battery Charger, is one of the most respected brands in the auto parts industry. Offering a warranty on every Battery Charger sold, Weego has become a trusted name that we are glad to have partnered with in our stock of quality parts. Confidence is what customers want when purchasing auto parts at their local shops, mechanics and online, and we provide this by not only offering the top quality Weego Battery Charger you need, but also through our superior customer service and order fulfillment capabilities. We understand that we are not only in the business of selling auto parts, but also in building strong relationships with our customers. For this very reason, we make it simple for you to contact us with any question and concerns that you may have when making a purchase for any part from our online store including the Weego Battery Charger. After your purchase we also highly value your feedback and encourage you to let us know what you think about our services, delivery times, customer support and quality of parts. We look forward to receiving your Weego Battery Charger order today and building a long lasting and strong relationship with you as your number one source for auto parts online.